Valerie Troutt with youth getting ready to sing. With many of its origins lying in African traditions of communication and dance, “call-and-response” interactions have played an integral role in community building throughout centuries. Often expressed in public gatherings in the form of song and dance, call and response practices have endured throughout time, continuing as a celebrated tradition in numerous cultures. In America, iterations of call-and-response practices are visible throughout many beloved genres of music including jazz, gospel, rhythm and blues, and hip hop. With roots linked to African spirituality and religious traditions, the pervasiveness of call-and-response practices helped guide societies’ manner of action and thought. Today, many of these traditions are still prevalent in contemporary culture. One need look no further than the ubiquity of hip hop music, and the timeless phrase: “When I say ___, You say ___,” to see the relevance of call-and-response practices in contemporary times. 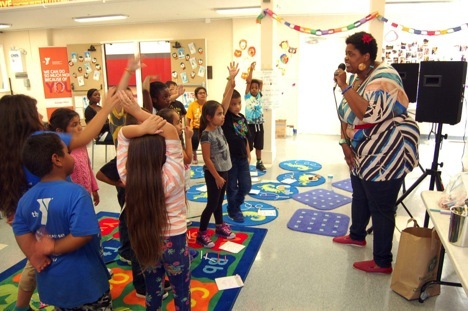 Our latest collaborative event with the YMCA Eastlake Chapter featured celebrated Oakland artist Valerie Troutt conducting her own call and response exercise. 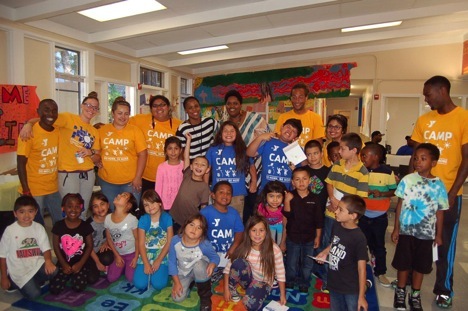 A formidable singer and songwriter, Valerie shared her talents with the youth of the YMCA during a community songwriting workshop. After a brief discussion about music, where youth shared their favorite artists and songs of the day, the workshop began. Opening with a brief introduction to the call and response tradition, Valerie began with a few short calls for the youth to respond to. “Oye ale ale,” Valerie sang into the air with the youth right on beat behind her, “Oye ale ale,” they shouted. As the kids warmed up with Valerie, parents began to trickle in, forming standing rows behind the seated youth. A couple more renditions helped to reinforce the timing of the responses, and soon, most were singing in rhythm with Valerie. 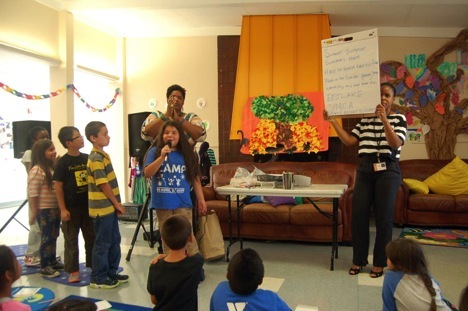 Valerie’s song-writing portion began with a participatory exercise. Calling on individuals to offer words and subjects to sing about, Valerie began to build a song around youth, happiness, and the summer season. After collecting enough input, Valerie began to transcribe the youth’s words, and slowly but surely a song began to form. “Summer summer, summer’s here,” the song began, “Have no worries, have no fears,” it continued. With each line the youth suggested additional lyrics: “Plants in the garden growing strong,” they said, “run and play and have some fun!” Incorporating rhyme into the song as well, the piece took on another element of repetition that kept the exercise catchy and engaging. In need of a harmonizing hook, and in an effort to support their club, the name “Eastlake YMCA,” was added to the song, expressed in a long drawn out bellow. While the collaboration started with the children seated, the excitement soon increased as the youth were antsy to dance along to the song they had created. Jumping to their feet, Valerie encouraged all the youth to sing their song with energy. Clapping her hands together to her own beat, Valerie quickly formed the foundation of the song, providing a background for the lyrics the youth created. Coaxing the youth to clap on beat, Valerie launched into song, “Summer summer, summer’s here, have no worries have no fear. Plants in the garden growing strong, showing respect to everyone,” she added. A couple renditions and the youth were in rhythm, singing along while clapping their hands to the beat. As the kids sang, staff and family filled into the room, creating a captive audience for the youth to perform for. After a few more call-and-response verses, Valerie invited the youth to come and sing her part. Lining the youth up to the right of her, she handed the microphone to each individual, letting them sing a line for the audience to then respond to. Quickly shuffling from youth to youth the song regained its form, culminating in a sing-a-long that involved kids, parents, and staff altogether. In a matter of minutes, Valerie had transformed the YMCA room into a joyous celebration. As a form of community building, Valerie’s efforts did much to engage youth in a creative manner. 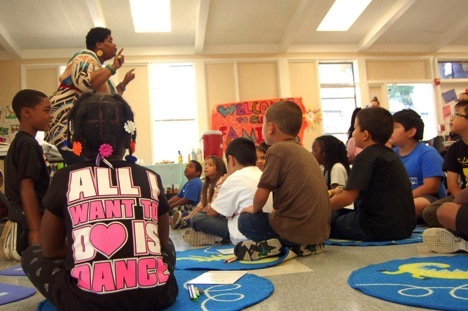 And as a form of healing, the call-and-response exercise also functioned as a form of self expression, allowing the youth to articulate their thoughts in a unique and vibrant manner. Although originating centuries ago in a continent thousands of miles away, it was refreshing to know that Valerie’s call and response exercise still resonates with the youth of today at Oakland’s Eastlake YMCA.